Oscar Cancino, former executive director of the Agua Special Utility District, speaks to investigators on Jan. 18, 2018. New details have emerged about the employment of two La Joya school board members at the Agua Special Utility District and their eventual departure from the utility district with large payouts. In a video recording released by the Texas Rangers, Oscar Cancino, former Agua SUD executive director, tells investigators about the manner in which payouts to two former employees unfolded. The Texas Rangers’ investigation into Agua SUD, which focused on the payouts, began in January at the request of the Hidalgo County District Attorney’s Office. The investigation was widely believed closed after the DA’s office notified the Rangers last month stating they didn’t find enough evidence to charge anyone with a crime. However, District Attorney Ricardo Rodriguez confirmed Wednesday that the Rangers were still looking into the utility district, though he didn’t know what they were focusing on. Salinas and Garza, the two employees who received the large payouts, were employed with Agua SUD where the majority of the board of directors consists of employees of the La Joya school district, where the two men serve on the board of trustees. Last year, they left their jobs at Agua SUD as a result of Senate Bill 814, which prohibited the utility district from hiring elected officials from the school district. Before the bill passed, however, the two employees entered into five-year employment contracts which later led to settlement payments of $221,000 for Salinas and $268,000 for Garza after the bill was passed. The full video of the interview, which runs about 15 minutes short of five hours, reveals more about Salinas’ and Garza’s employment there, all according to Cancino. As noted previously from the interview summary, Cancino said Salinas did not report to him directly, unlike the other employees, but instead answered to the board. In the video, Cancino elaborates on that, saying he raised concern about having to approve Salinas’ payroll despite not having direct oversight of him. When reached by phone, Salinas explained that he previously did report to the executive director, who at the time was Julio Cerda. But after an altercation between the two men in 2016, the board members at the time moved to have Salinas report directly to them. That continued after Cerda’s departure as well as after the election of new board members. Though Garza was at the office on a daily basis, Cancino told investigators he very seldom saw Salinas at the office — only about once or twice a week for about an hour each time. Salinas conceded that he probably only spoke to Cancino about eight or nine times throughout his tenure there, but because his work as the community outreach coordinator was done mostly outside of the office. Cancino also said Salinas and Garza were the only employees who were salaried. The others, he said, were hourly, going into more detail at about two hours and 44 minutes into the video. During one board meeting, Cancino said one of the board members, Homer Tijerina, had said he wanted all employees to check in to keep track of when they were working. However, the other board members said “he reports to us, don’t worry about him,” Cancino told investigators. When it came to making the payouts, Cancino said of the Agua board members, Ricardo Ochoa — who like Tijerina does not work at the school district — argued they shouldn’t have to pay since it was the state mandating that the employees no longer work there. Cancino said he agreed with that. “That was the first good point that any of the board members made, which is: ‘Let’s just see where this goes,’” Cancino said, adding that his recommendation was to defer to the attorney general’s office to guide them on how to proceed. But the majority of the board members wanted to proceed with the settlements, he said. Throughout the interview, the investigators continually questioned why the board of directors was going through so much trouble for the two employees and asked Cancino if he believed the board members who worked at the school district were getting something in return for their effort. 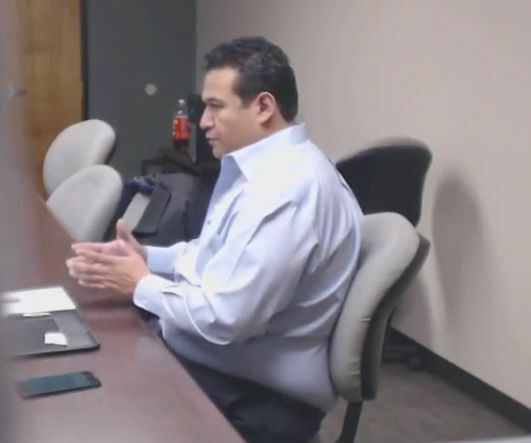 At two hours and 15 minutes into the video, Cancino replies by speculating about the possible quid pro quo relationship between the Agua SUD board members and the La Joya school board, saying he heard some of the board members received promotions. Cancino’s interview with investigators also shed new light about his resignation in September 2017. The former director said he was approached by three board members and Javier Peña, an attorney retained by Agua SUD, about a week or two before he resigned. According to Cancino, they told him they appreciated everything he’d been doing, but felt they needed to go into a different direction. Cancino did not return a request for comment.